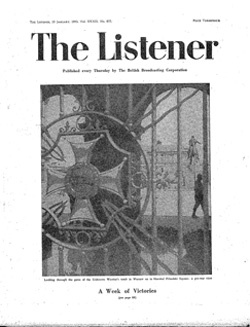 Last month, I promised I would return with the second of Henry Reed's essays for The Listener on English poetry during the Second World War. The first, "Poetry in War-Time: IThe Older Poets," concerned the work of Edwin Muir, Louis MacNeice, and C. Day-Lewis. The second article, "Poetry in War-Time: IIThe Younger Poets" (.pdf), appeared in The Listener on January 25, 1945. Reed opens with the argument that the younger poets writing during the war were most influenced by Dylan Thomas and W.H. Auden (some to their benefit, others to their detriment). There's a very funny bit wherein Reed lists the styles which were perfected by Auden and then imitated by young up-and-coming poets: the 'Famous Names poem'; the 'Bird's-Eye View of Europe poem'; the 'Evil Implicit in Our Age poem'; the 'Week-End Trip poem'; and the 'Post-Coital Insomnia poem'. We can forgive Reed for this statement if only because, while he was heavily influenced by Auden, he preferred to write like Eliot. The first new poet successfully to emerge was the original and delightful W.R. Rodgers, whose volume Awake! created a sensation in 1941. He is particularly valuable for this brief survey, since he has given some account of his development. 'I was schooled', he says, 'in a backwater of literature out of sight of the running stream of contemporary verse. Some murmurs of course I heard, but I was singularly ignorant of its extent and character. It was in the late '30s that I came to contemporary poetry, and I no longer stood dumb in the tied shops of speech or felt stifled in the stale air of convention'. His remarkable poem 'Summer Holidays ' survives as one of the best long poems of the war. It is full of brilliance and gusto, wit and irony. Rodgers is a poet fond of alliteration and whimsical assonance: he loves words to set him problems, and he likes skirmishing with alliteration on awkward sounds like 'k' and 'j'; and he succeeds amazingly. Words tantalise him as they did Joyce. He is not a sentimental poet and this enables him to guy poets like Hopkins and Auden, who have loosened his tongue. He has quietened, and deepened, since the publication of his book; his poem 'Christ Walking on the Water' is wonderful in its imaginative and verbal resource (p. 100). The three poets, however, who with Rodgers impress me more than others who have emerged since the war, are David Gascoyne, Vernon Watkins and Alun Lewis. Gascoyne's verse, of course, goes back some years before the war; his recent volume is called Poems 1937-42, and before 1937 he was known as a surrealist. Surrealist poetry is rarely very interesting, but it loosened Gascoyne's tongue for more deliberate work; and the associations with France which it probably brought him have provided him with an additional background. He is the least provincial of the younger English poets, and the one who seems best able to combine versatility and sincerity; poems as different from each other as his 'A Wartime Dawn' and 'Noctambules' are equally convincing. His series of poems called 'Miserere' is a fine achievement, deservedly well known. Behold the Man: He is Man's Son. Vernon Watkins I have difficulty in writing about. I find him at times very hard to understand, sometimes impossible; yet if a premature judgment may be allowed, I believe him to be the one poet of his generation who holds out unequivocal promise of greatness. I find myself not minding his obscurity; or as with Mr. Eliot, I am prepared to wait or to take on trust. His philosophy or metaphysics I suspect I should find antipathetic. Yet I never read him for long without knowing that here is a voice, at times one of the very loveliest: His music is rich, his cadences are subtle and he can prolong a line with great delicacy. Like Rodgers, Gascoyne and Mrs. Ridler he can write a long poem which sustains one's excitement to the end; his long 'Ballad of the Mari Lwyd' is a remarkable work. Dylan Thomas has left his mark on some of Watkins' poems, but he is more truly and deeply rooted in the pastin Rilke, Yeats and Blake particularly. His poetic allegiances are of the kind which exact, intellectually and technically, a good deal from a devotee. Who saw where tears of pity fell. Though Watkins seems to me the most brilliant of the newly-emerged poets, I feel a more intimate sympathy with Alun Lewis. We shall not see the fulfilment of Lewis's promise, and the developments hinted at in the later poems from India will remain incomplete. He was, on the surface, a simple poet; he painted the sad exile of the soldier with the utmost honesty, and his poetry is doubly moving because for all its firmness and objectivity, it is the poetry of one in whom war and banishment have broken the heart. This can go side by side with a devotion to fellowmen, and in Lewis it did; his verse and prose are the expression of it. The loss of him, as of Sidney Keyes, is greatly to be mourned. Keyes was a younger poet than Lewis, passionately dedicated to literaturehis background was an extensive and an ideal oneand at his best, as in 'The Wilderness', he was a dazzlingly accomplished writer. It is idle to speculate on what their futures might have been; better to read their four small books of verse; best of all perhaps to read them quietly: I cannot but think that they would feel genuine horror at the fulsome praises and the emotional falsifications which will always coagulate round such tragedies as theirs. How they would hate this! For they were good poets, each sincerely allied to great traditions of literature through a healthy predecessor: Keyes through Yeats, Lewis through Edward Thomas. They therefore felt themselves to be part of literature itself and it is as that that they would prefer to be remembered and judged. There is much of their verse I could wish to quote: here I can merely transcribe a sentence from a letter of Lewis's, quoted in an anthology by Mr. Keidrych Rhys. It is worth rememberingindeed I think it is unforgettable—for it expresses the war-time predicament of Lewis and Keyes and of thousands of their fellow men and women: 'So much is dormant in me that I hardly know how I go quietly through my days as I do' (pp. 100-101). During the course of the article, Reed also makes honorable mention of the talents of Roy Fuller, Anne Ridler, F.T. Prince, Terence Tiller, Norman Nicholson, John Heath-Stubbs, and Laurie Lee. Reed's impartiality and objectiveness seems remarkable, considering these are the poets whom Reed will ultimately be compared with, and for the most part, found wanting. At the time of its writing, with his first volume of poems within view on the horizon, he certainly considered himself their peer. With the exception of his Lessons of the War, however, Reed became just another one of the voices lost at sea.